The Volkswagen Atlas is the crossover that is supposed to save Volkswagen in America. While it may be really late to the game, VW finally figured out that they need to be aggressive on pricing to compete so they made the Atlas cheaper than the key rivals in this segment. 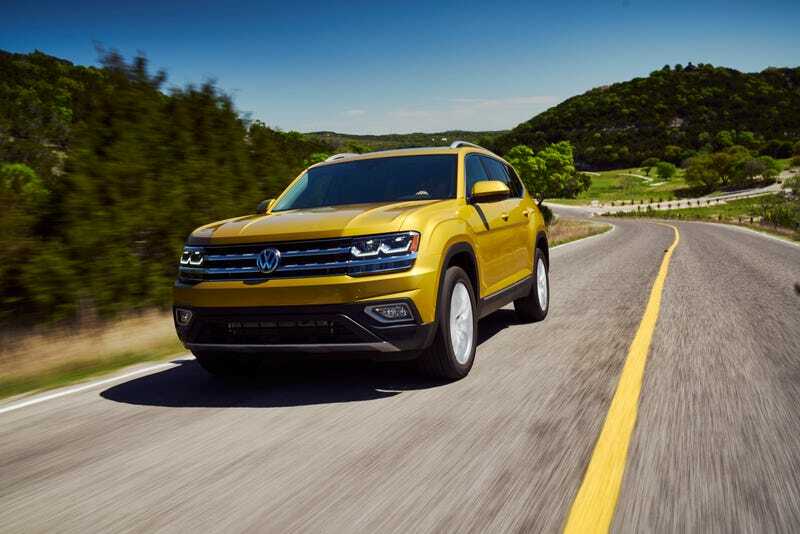 Like most other Volkswagens, the Atlas follows the same naming structure starting with the base model S, then moving to the mid-level SE, and range-topping SEL and SEL Premium models. An Atlas S with 2.0-liter turbo four and front-wheel-drive starts at $31,425 including the $925 destination fee. The S comes nicely equipped with standard features such as Apple CarPlay/Android Auto integration, a 6.5-inch touchscreen, LED lights and a backup camera. While a four-cylinder may seem like it might struggle to move such a large car, the TSI engine is rated at 235 horsepower and 258 lb-ft of torque. It won’t be quick, but it should get the job done. If you feel the need for more power or more traction, you can upgrade to the 276 HP VR6 and 4Motion all-wheel-drive for $34,625. This price makes the Atlas slightly more expensive than a base model Pilot but cheaper than the Highlander LE when equipped with a V6 and AWD. Also available will be an S Launch Edition that will upgrade the infotainment unit to an 8-inch screen and add a panoramic sunroof. The Launch Edition will only be available with the VR6 and prices at $34,425 for a FWD model and $36,225 with 4Motion. Stepping up from the S is the V6 SE trim that includes key features such rain sensing wipers, leatherette seating surfaces, blind spot monitor, push button start and power seats. An SE with FWD will set you back $35,915 while an AWD version will go for $37,715. Above the SE is the SE with Technology and is likely to be the most important trim in the Atlas lineup because most folks in the market for these kinds of crossovers don’t buy base models or fully loaded ones, but rather go for the well-equipped middle trim versions. I can tell you from experience that the two most requested features on three-row crossovers are leather seats and advanced safety tech such as collision mitigation and adaptive cruise control. The Atlas VR6 SE with Tech offers the full driver’s assistance suite that includes adaptive cruise control, forward collision warning, autonomous emergency braking with pedestrian monitoring, and lane departure warning in addition to other upgrades such as a power liftgate and remote start. Pricing for the SE with Tech is $38,015 for the FWD and $39,815 for AWD, making the Atlas cheaper than both the Pilot and Highlander when similarly equipped. The SEL prices at $40,085 for the FWD and $43,615 for the 4Motion. It adds additional features to the SE with Tech such as panoramic roof, memory seats, and park distance control. For those folks looking to spend serious money on a VW Atlas, there is the full loaded SEL Premium that tops out at $49,415. For this price, you get the really fancy stuff like 12.3-inch virtual cockpit display, 20” inch wheels, LED tail lights, and parking assistant. Volkswagen will offer an R-Line appearance upgrade for the SE and SEL trims for $1,960, second-row captain’s chairs on the SE and above trims for $625 and 20” in black wheels for $995 on the SEL and $235 on the Premium. Volkswagen says the S and S Launch models in addition to the R-Line and other visual upgrades will be late availability, but the rest of the Atlas lineup should begin to arrive at your local VW dealer in May.